rijBij is the distance between the atoms i and j with the interaction type Bij forming by the pair-wise heavy atoms between ligands and proteins; Bij is eithera hydrogen bond or a steric state; qi and qj are the formal charges and 332.0 is a factor that converts the electrostatic energy into kilocalories per mole. The lig and pro denote the numbers of the heavy atoms in the ligand and receptor, respectively. is a simple atomic pairwise potential function (Figure 1.) 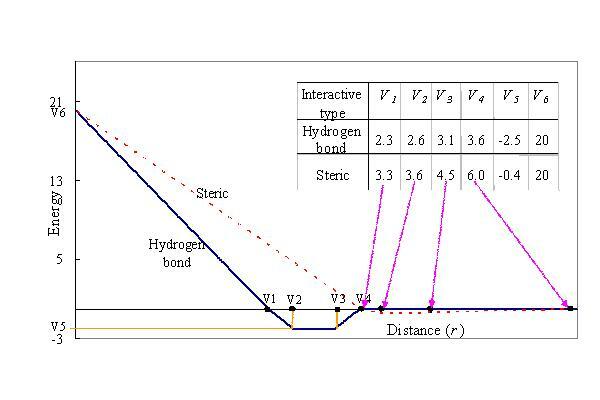 In this atomic pair-wise model, the interactive types are only hydrogen binding and steric potential which have the same function form but with different parameters, V1, . . . , V6 (defined in Figure 1.) In this model, the atom is divided into four different atom types: donor, acceptor, both, and nonplar. The hydrogen binding can be formed by the following pair atom types: donor-acceptor (or acceptor-donor), donor-both (or both-donor), acceptor-both (or both-acceptor), and both-both. Other pair-atom combinations are to form the steric state. Figure 1. The linear energy function of the pair-wise atoms for the steric interactions (red line) and hydrogen bonds (blue line) in GEMDOCK. F(rijBij) is defined as above except the value is set to 1000 when rijBij < 2.0 angstroms and dihedis the number of rotatable bonds. We followed the work of Gehlhaar et al. (1995) to set the values of A, m, and θ0. For the sp3-sp3 bond A, m, and θ0 are set to 3.0, 3, and π; and A = 1.5, m = 6, and θ0 = 0 for the sp3-sp2 bond. where WPelec and WPhb are the penalties for the electrostatic and hydrophilic preferences, respectively.